Back from the Greek island of Chios and the crazy Rocket Battle which I wrote about and filmed here. Today is a classic North Wales day of wind and rain, one of those days when you can't see further than the end wall. The stream in the garden is swollen by the rain and roaring like the Orinoco, the trees are swaying, and you can't go outside for more than a minute without being soaked by the fine drizzle that seems to come at you horizontally. Good day for decorating! A map of some island somewhere...? The picture shows what might be a problem with one of the external walls. 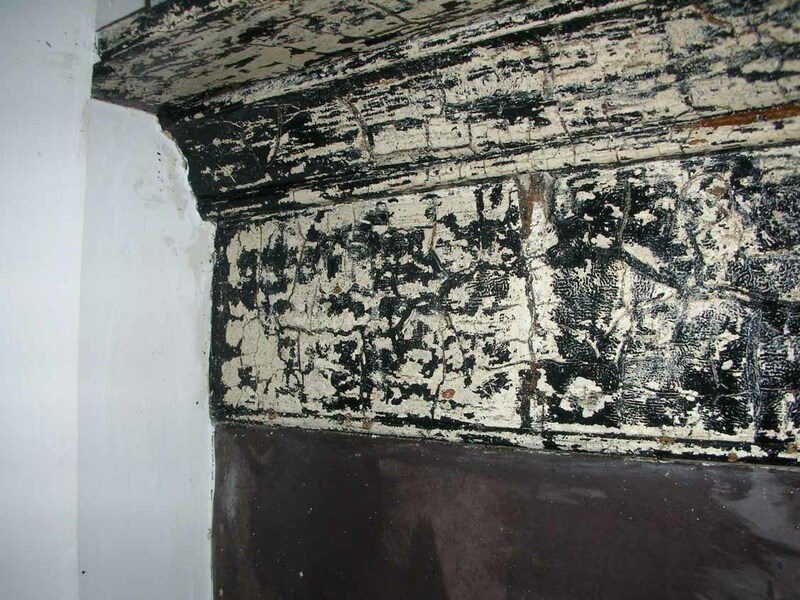 When I began rollering over the magnolia in the main bedroom, huge flakes of the existing paint came off, leaving bare plaster (years old, not new.) I've applied (for diy minded readers) a layer of PVA to waterproof and prepare the surface for another coat. 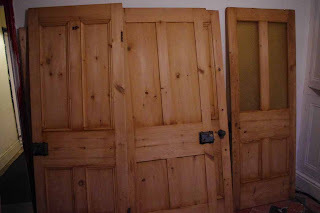 I've also been sanding and oiling the door of the second bedroom, which was made from reclaimed boards about fifteen years ago when a concrete floor went down on top of the new damp course. It's a real rough job, gaps in the planking, crudely sawn cross timbers, and rusty reused floorboard nails - the old flathead ones - and it's beautiful. I love the idea of reusing those old bits of wood that generations have walked on, even if it's a bit of a 'feature'... Reclamation every time! I'm taking stock of where I am with the restoration project, and especially the eco aspects of it all. 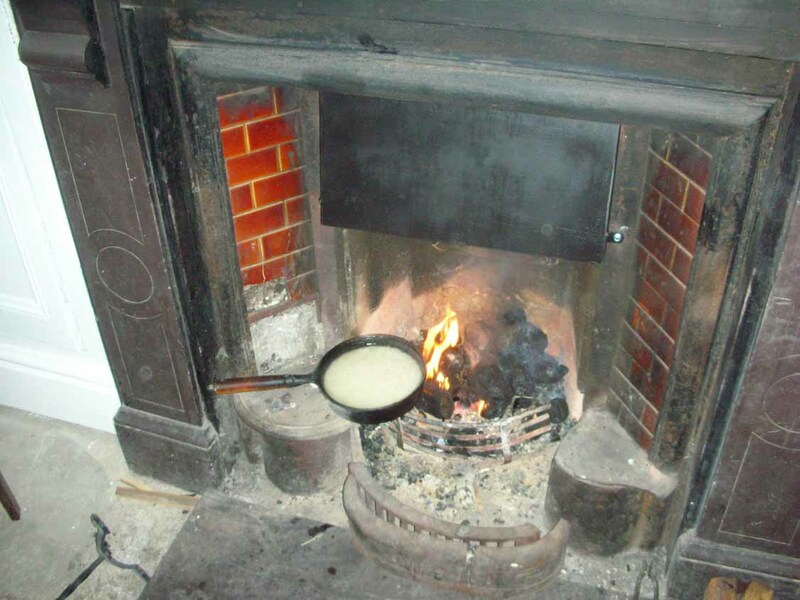 Since the external insulation was cancelled I've had a rethink about the heating. Air Source is not really appropriate now, it needs the outside cladding to be properly efficient and in any case I have always had reservations about the noise (and the overly large radiators that these systems need). 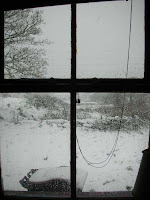 Solid fuel seems unreliable, and I've heard bad things about it - stoves going out while you are at work during the day, and being forced to choose between heating and hot water in the winter. Electric storage heaters, even the modern ones, don't really do it for me either. 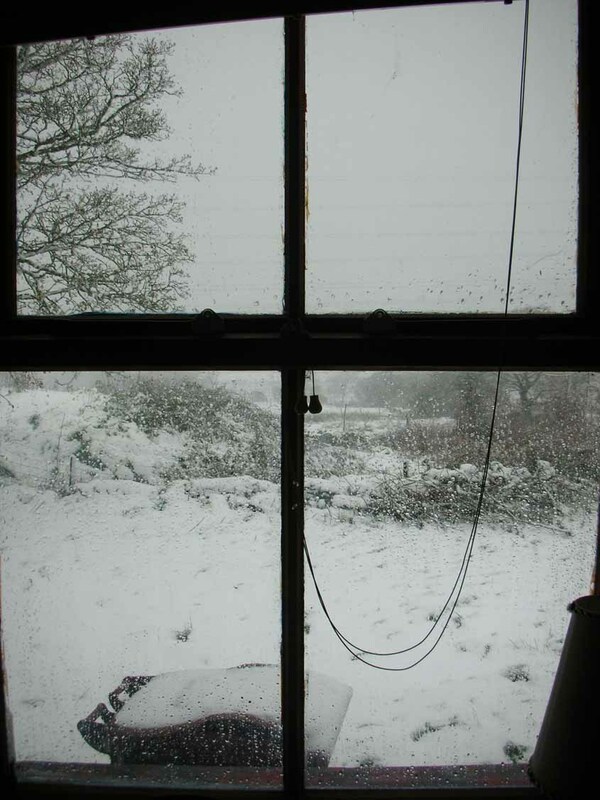 Reluctantly I've opted for oil-fired central heating, with a condensing boiler, and I'm hoping to get double-glazed windows on the three walls that don't yet have it. In any case I'll carry on having a coal fire in the living room, and I'll use the heating as sparingly as possible (not difficult when fuel oil is the price it is). 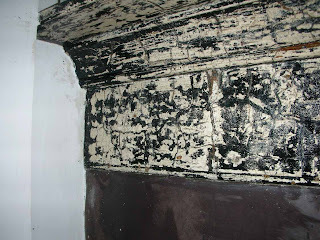 Back to the struggle of renovation, after the flights of fancy and the family history of some of the previous posts. I am going to add some photos today of some of these 'features' that I keep mentioning, and the restoration that I'm carrying out on them. Number one is the doors. It's funny how you get accustomed to doors, the demarcating line between cooking, sitting, showering, sleeping; between porch and landing and hall; those solid blockers of draughts. For the past five days I've had all these artificial barriers removed. I've been living in an open plan New York Loft type environment where the uses of the rooms have blurred and shifted and I've found myself sitting on the edge of the bath to eat, wandering into the bedroom with a frying pan in hand while I talk on the phone, or sleeping in front of the fire on a mattress, fresh from surfing the net to look at Farrow and Ball paints. But my own doors are back from their dippin' an' strippin' and while I thought they would come up lovely, as they say, the finish that Complete PaintStripping of Chester have got is out of this world. 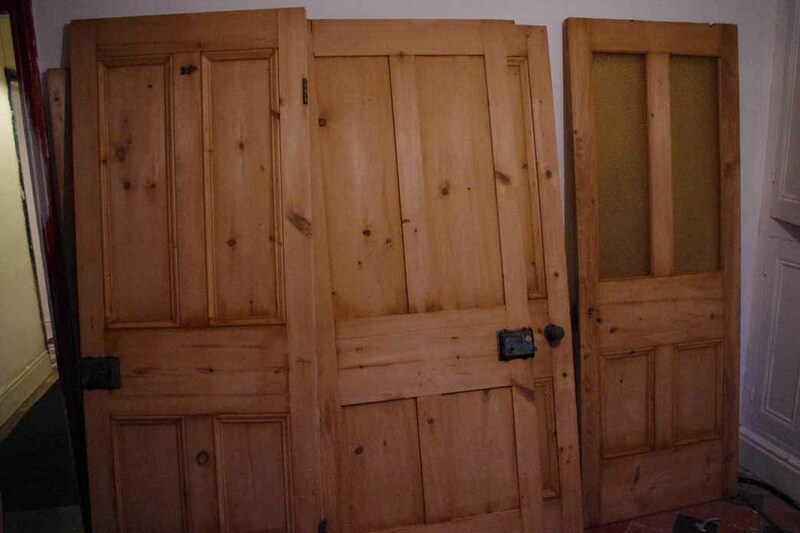 The doors (the photos should illustrate this) were old, battered pine, covered in layer after layer of shiny gloss paint and with their handles and door furniture coated in the same stuff. On return they are all soft, glowing natural wood, still very slightly damp after the stripping process. Even the Victorian glass and the metal handles are now sparkling and polished. Thanks to Steve for a great job, and Simon for his very careful courier service! I've also been cleaning the remnants of some ancient black paint from the slate surrounds of the dining room fireplace - see picture - and also made a start on the built in range in the kitchen. This is very rusty inside and I'm not going to attempt to make it useable, but I will be tarting it up to bring out the vintage character - and make it a 'feature'! Pictures of that too. I've just found that you can view the photos at a larger size if you click on them, btw. Doors back, beautifully soft and glowing! While the eco-renovation is going on - and I promise to bring this blog back to the actual project from the personal regions where it has wandered, very soon! 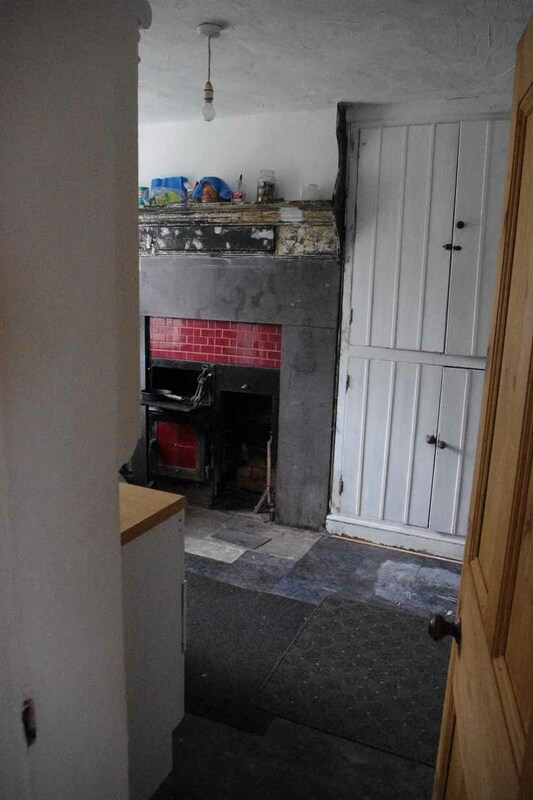 - I am no less determined to update the decor in this house, which is a quirky mixture of Victorian features, faded 1930s wallpaper, faded 1980s furniture and unfortunately non-fading Magnolia paint. 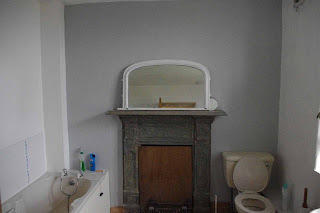 To this end I've been looking at Farrow and Ball paint swatches and talking about 'feature walls' and thinking (though many will laugh hollowly at this) minimalist. 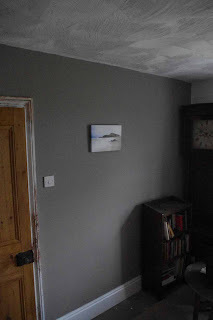 My image of the house-to-be has sometimes needed to be brought into sharper focus, and I'm being deeply aided in this part of the project by a good friend, one whom I feel I should now credit, though she must remain anonymous. Some friends you value for their support, their positiveness, their backing you to the hilt even when you're in the wrong. This is not one of those friends. This person has the sharpest of eyes and the unflinching honesty of a dues-paid journalist. She is someone who absolutely speaks her mind, refers to herself as a harridan, although her true nature is warm and caring, and has a voice which, usually musical and pleasant, is - when she wants it to be - like the crack of a tiny whip, or so she would like to think. On any given question of decor she will always, always call it like it is, tell you what you are doing wrong and why, and as if this is not irritating enough, she backs it up with a mass of knowledge about interior design and colour, an unerring feel for bringing out the best in a house, and the most excruciating good taste. 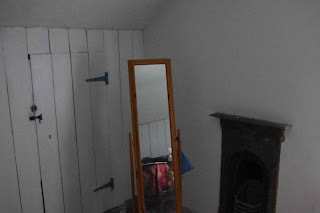 When she tells you not to use 'Antique White' type gloss paint on old battered woodwork, because it will show the imperfections in the wood, you find out for yourself that she is right. If she suggests that the same off-white shade will look dirty next to a pure white wall, you step back, brush in hand, and have to agree. When she cracks that tiny whip, making you you throw out a rickety old kitchen table (which you'd kind of grown accustomed to) because it will introduce space and beauty into your life, you have to listen, and if you don't, well, you've only yourself to blame. Her own Georgian house is a clean, minimalist marvel of restoration, space, peace and utility, brilliantly conceived, skilfully executed; to every room she will add the one sure, confident touch of colour or texture which makes it it both homelike and beautiful. (Estate agents have been known to visibly salivate when asked to sell her previous properties.) I should also say that when my friend's talents are engaged she is unfailingly supportive and helpful, sympathetic and generous; and that her own green-eyed beauty perfectly complements the environment she has created. So it is my good friend, this small potent weather system in human form that I now honour here. It is her advice and mentoring that are behind my own experiments in decor, and needless to say any mistakes that remain are entirely my own. All my internal doors went off today, to a place near Chester to be dipped 'n' stripped, so I'm preparing the wooden frames for painting while I can get a proper unimpeded brush to them. I hate prepping - the noise of the sander, the boredom of scouring out every bit of old gloss paint, the fine white dust that gets everywhere, even into your eyelashes, so that you end up looking ninety before your time, to say nothing of breathing in the crap. 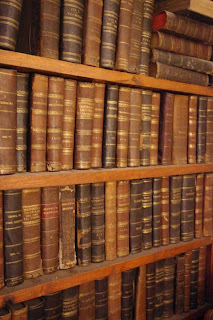 I don't want to think about it, let alone do it, so to take a break from all that I want to write something about an absolutely unique part of this house, the Quarrymen's Library. My great-grandmother's two brothers lived in the village of Bontnewydd, just down the road, and worked in Dinorwig, one of the huge slate quarries that provided most of the work for the people of this part of Wales, back in the late 19th Century. The old way of dividing work up in the quarries was called the 'bargain' system, where a group of quarrymen would negotiate with the (usually English) foreman for the right to work a particular seam. If the seam yielded no useable slate, they got no money at all (in fact I'm pretty sure they used to have to pay the foreman anyway, whatever money they made, for the right to work the slate). One summer day in 1886, Owen and William Pritchard bargained for a place to try their luck and went to work on it. What happened next was described in the Welsh language newspaper of the time, the Herald Cymraeg : the rock upon which the two brothers were working became detached from the side of the hill and fell some hundreds of feet to the bottom of the shaft. Witnesses saw the two workmen crouching on the piece of rock as it fell, seemingly frozen in those attitudes, after which their crushed bodies had to be recovered from underneath several tons of rock. They were pronounced dead at the scene of the tragedy. I know a little of my family history. Owen and William had a younger sister, Mary Pritchard, my great grandmother, who had become Mary Williams through marriage the previous year. Their parents lived on a farm just outside Bontnewydd called Maesmyrddin (Merlin's Field, in English): their mother was called Margaret. It is easy to imagine on that day in 1886 some quarry officials, or perhaps some workmates of the two brothers, climbing down from a horse-drawn cart in the unaccustomed middle of the day in the farmyard; Margaret coming to the door with a greeting on her lips; turning white on seeing the expressions on their faces; framing the questions, Which one? How bad? - and the answers : Both. Dead. Margaret died within a year, although her husband lived on into the new century, and all the family have of these two young men (who died childless) is their library. Another big part of life in this area was the religious revival that happened at the end of the nineteenth century - the fiery Welsh oratory, the Temperance (abstaining from the demon liquor), the huge open air Methodist meetings, the chapels built in every remote and sparsely populated valley in North Wales. Owen and William must have been part of this, for they spent what I guess was a great part of their earnings on volumes of sermons, in Welsh, from famous visiting or local preachers. They paid to have these books bound in black or brown leather with their initials in gilt lettering on the spine. So as I sit writing this, in what is itself an old quarryman's cottage, I look across the room and see an old oak bookcase full of sermons and religious tracts, written in a language which I cannot understand; a language more and more incomprehensible even to the local people here, as the old written Welsh recedes into time and becomes a matter for scholars and historians. The tragedy, the religious fervour have all faded into history, the two brothers are in a grave in an overgrown churchyard down the road, and the Dinorwig Quarry closed in 1969. But the books are still here, in their original bookcase in the corner of my living room, which I call the parlour. The faded gilt lettering on their spines is lit up, sometimes, by the setting sun in this west-facing room, and I think, Owen and William, may you rest in peace. I want to write something a little more personal about this house, which has been in the family since 1951. My grandmother grew up in this part of North Wales, which was and remains very Welsh-speaking. She walked the three miles into Caernarfon every day to go to school (in one of the medieval towers of the town walls). She left the area in about 1915 to get married to my grandfather, Thomas James, a West Walian whose own father was lost on the Welsh ghost ship Resolven. She spent her married life in Cardiff but never forgot her roots, and when she received a small inheritance, as a widow, she bought this cottage for £500 and her sons and daughter, my mum, used it as a holiday home. Generations of kids came up to stay with our family and roamed all over North Wales, to Llanddwyn Island, the magical valley of Cwm Pennant, up to Snowdon and the Eagle Tower in Caernarfon Castle. 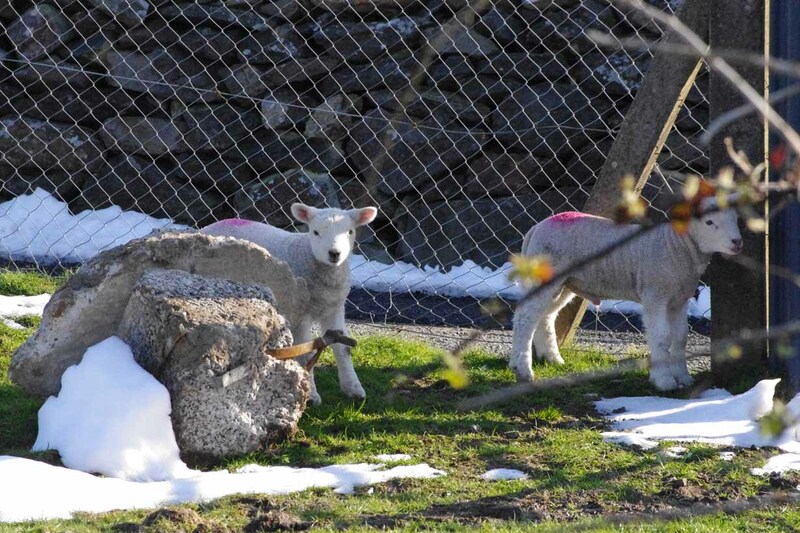 Later on my brother Toby, who died in 2010, lived in the house with some Oxford hippies, who soon went home, and some goats, who ended up in someone's freezer. Among the visitors to this cottage have been writers like Peter Levi, the theatre director Peter Cheeseman, artists and musicians like Victor Neep and James Bridgen and more recently friend and photographer Chris Clunn and travel writer Jane Lovatt, and lots of locals and of course friends for the weekends. It's pretty basic, and a challenge in the winter, but this house has always been well-loved by almost everyone who's come through the door. I've already posted about the lack of much renovation on the place. So I'm upgrading, but keeping the 'features' (a private joke. 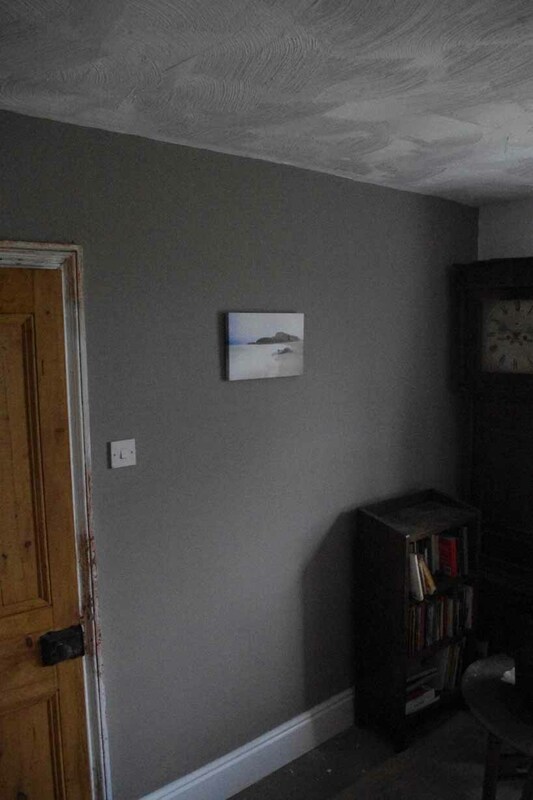 Everything you don't like, or anything that sticks out a mile that you can't get rid of is 'A Feature' - comes from when I was renovating a much bigger house down the road in Maentwrog, Gwynedd. Mind you the 'features' in this cottage really are nice). I just like the idea of a place with slate fireplaces, wooden Victorian cupboards and sparrows nesting under the eaves ... and solar panels, green technology and wireless broadband, Snowdonia calling the world! AIR SOURCE HEAT PUMP... WHAT? Of all the technologies I am looking at to heat this house, the Air Source Heat Pump (ASHP) is the most intriguing somehow. As far as I can gather it works on the same principle as a fridge or a freezer, in very simple terms a heat exchanger bringing in warmer air from the outside, compressing it into hot water, and passing this heat into standard radiators. It runs on electricity, so there is an environmental impact, although my plan is to offset this with solar panels to generate some of the power (you may well scoff at this if you're familiar with North Wales weather). Disadvantages? You have to install the pump somewhere on or near the house, and it does have a visual and more importantly a noise impact. Descriptions of the noise vary according to who you talk to. I've seen internet forums where people say the noise output of these units is quite high, describing it as similar to a washing machine on spin cycle; others say it is no noisier than a fridge. Other problems I have heard about include the fact that they can act up in very cold weather if they're not sited properly, using electricity to defrost themselves instead of heating me. I'm having a visit from an engineer / surveyor from the contractor who would be installing the ASHP in a day or two and I'll post about this! 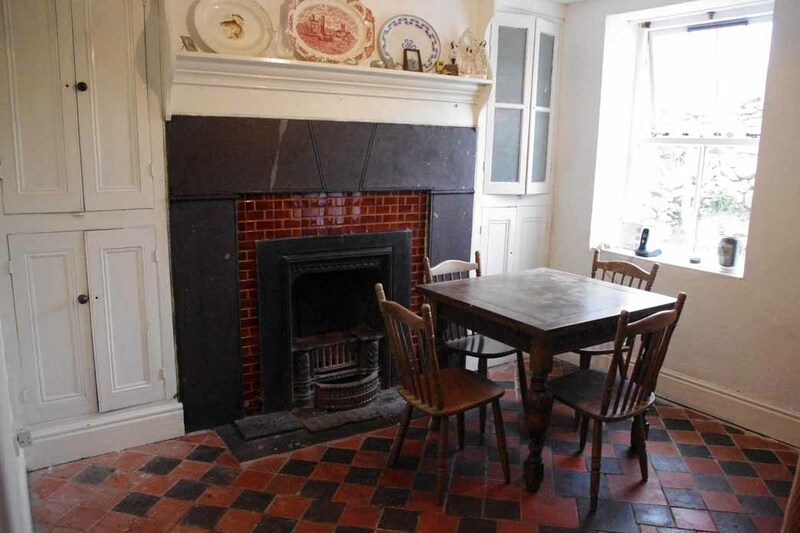 It's a modest 2 storey, stone and rubble construction cottage built in about 1895 - 1900. It has local Welsh slates on the roof, and a lot of slate mantelpieces and fireplace surrounds, plus the red and black quarry tiles on some of the floors. The windows are single glazed ones that look like sash windows, although they are top opening casement since the old sashes were replaced twenty or so years ago. It sits in its own plot of land and has a great view westwards to Anglesey and the sunsets over the Irish Sea (on a very clear day you can see the Wicklow Mountains, about 90 miles away, although that's quite rare). It's about 800 feet up, and more or less west / east oriented, which means it gets sunshine for a good part of the day. Assuming it's sunny! The weather up here, with prevailing south-westerly winds and lots of rain coming across from Ireland, is 'interesting' to say the least! High winds for much of the time, not much frost or snow, occasional thick hill fog or sea mist creeping up the hill, fairly high rainfall, and the occasional still, sunny, warm day when it is a tranquil paradise. - with just coal fires for heating, and the coldest weekend for at least a year is coming up. Behind the house the hills are topped with white, and there's a freezing east wind blowing, promising snow overnight or tomorrow. 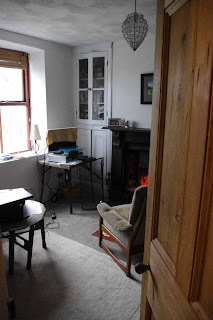 At the moment I'm barricaded into the one room, the parlour, which is a box of heat thanks to a constantly-tended coal fire. When I go out of this room, into the kitchen say, the temperature drops a good (or a bad) 10 degrees. 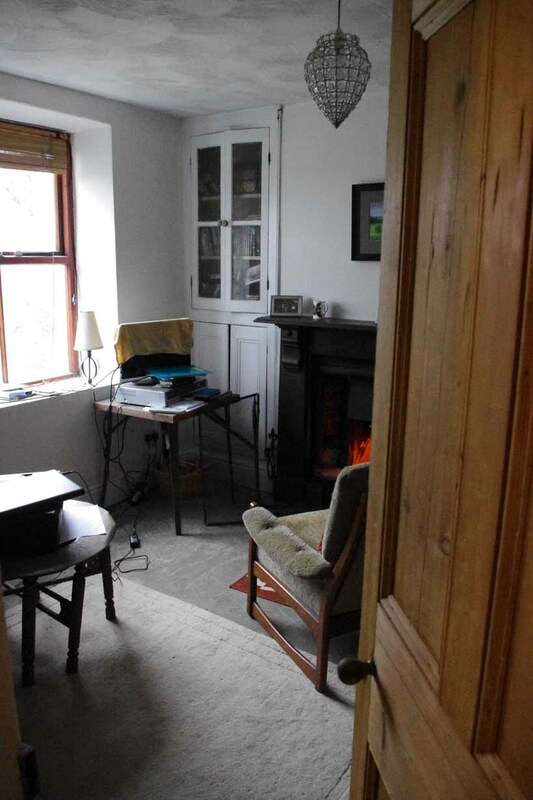 I'm doing this partly to make my house more liveable in, as you might expect, but I've chosen the 'greenest' forms of heating and power out of an interest in sustainability and a wish to have a lower carbon footprint. I'm not a green evangelist, but it would be good to feel I'm living a bit more in tune with the planet. End of pompous statement!